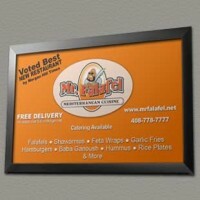 Mr. Falafel in Morgan Hill, might just be one of the best places to eat in Morgan Hill. Located in Downtown Morgan Hill, they have plenty of off street parking. They serve Falafels, Shawarmas, Feta Wraps, Garlic Fries, Hamburgers, Baba Ganoush, Hummus and much more. Don’t just take our word for it. The Morgan Hill Times voted them the Best New Restaurant.